Benton, IL: I-57 Dragstrip played host to the “Biggest Little Door Car Race in the Midwest,” the 8th annual JEGS Summer Door Car Shootout last weekend. Nearly 200 of the best door car racers from the region were greeted by sunny skies, great prize money and a growing array of valuable prizes throughout the weekend. The unique APD King of Illinois event annually features a $500 entry fee with a 100%, winner-take-all payback. 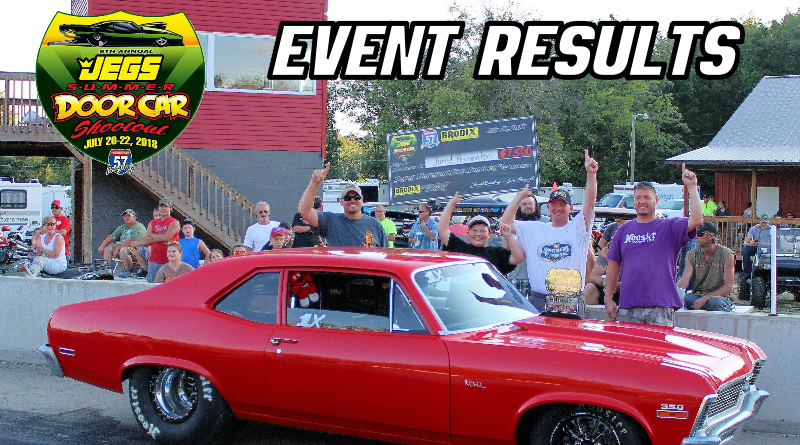 More than 25% of the JEGS Summer Door Car Shootout entrants ponied up the cash entry, making for the biggest payday in event and I-57 Dragstrip victory: $26,000 to the winner! At days end, it was another longtime I-57 Dragstrip regular, Ken Jones taking home the cash. The win capped a huge month of Jones, who scored a $5,000 victory at the same facility on July 3, and also won a $2,500-to-win event at nearby Accelaquarter Raceway in early July. Jones bested Indiana-based Bobby Stephens for the huge APD King of Illinois payday. In addition to the big winners, few racers left the JEGS Summer Door Car Shootout empty-handed. Over $30,000 in prizes were awarded to competitors throughout the weekend thanks to support from event sponsors including: JEGS, Ohio Crankshaft, BRODIX, Moser Engineering, BTE, Vintage Trailers, Nitrous Express, APD, VP Racing Fuels, Mickey Thompson Tires, Auto Meter, Flo-Fast, K&R Performance Engineering, California Car Cover, Racepak, AirTek, Digital Delay, the Labor Day No Box Classic, the Southern Footbrake Challenge, the Ohio Crankshaft No Box Nationals, the Footbrake 150, Hoosier Racing Tire, Wiseco, FTI, Racing RV’s, ThisIsBracketRacing ELITE, Tuffpaw, Weld Racing, Todd’s Extreme Paint, Huntsville Engine, Dedenbear, Dixie Racing Products, Fastronix, Renegade Racing Fuel, Abruzzi Transmissions, Manley Performance, Dramatic Effects Photography, Drag Race Solutions, Jesel, Folk Race Cars, J&J Performance, Accelerated Graphics, Mark Sullens E85 Carburetors, DoorCarSolutions.com, Racer Tees, and more. For more information and to keep up to date on next year’s JEGS Summer Door Car Shotoout, visit www.i57sdcs.com.